Ask Mr. Sage: When Is It Too Late for Autumn Planting? When is the best time for planting in autumn? How do you know when it's too early or too late for putting plants in the ground? My brother and I disagree about timing even though we both live in USDA Zone 7. He's in Albuquerque and says it's okay to plant throughout the month of November. I live in Richmond, Virginia, and think the best window is from the last week of September through the first week of October. Can you help us settle this argument? Both arguments have their points, but neither is quite on target. First, remember that although you both live in roughly the same USDA Cold Hardiness Zones -- Richmond is 7a and Albuquerque is 7a and 7b -- those classifications only govern average winter low temperatures. Our guideline is to wait until daytime temperatures have cooled and are less than 80 degrees F before beginning to plant. Then we stop planting about a month before first frost or first freeze usually occurs. For our mild, coastal area, the National Oceanic and Atmospheric Administration predicts a 50 percent chance of first frost by the end of the first week of November, which means that we would quit planting by late early to mid-October depending on our instincts about local conditions. NOAA's nationwide Index of Climate Normals provides information for each state concerning dates when frosts and freezing temperatures will first occur. However, it appears that a list linked to individual states no longer is available. To reach the data for your state, it may work to google its name and the phrase "freeze/frost occurrence data." Here is an example of a typical page: https://www.ncdc.noaa.gov/climatenormals/clim20supp1/states/CO.pdf. Using this address, you could also search your local information by substituting your state's two-letter acronym (capitalized). Each PDF offers data for numerous cities. 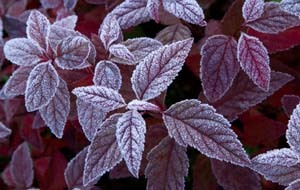 The threshold levels range from light frost (36 degrees F) to hard frost (28 degrees F). NOAA predicts the likely dates for reaching these temperatures at three levels of probability -- 90, 50 and 10 percent. Our comments in this article are based on NOAA's dates for 50 percent chance of 36 degree F (first frost). Giving plants at least a month to establish roots before first frost helps anchor them so they aren't damaged by frost heave during freeze-thaw cycles. As water in the soil freezes, it causes the ground to expand. Poorly rooted plants may rise up during freezes and not settle back into the ground when it warms. Exposed roots become damaged. As the ground freezes -- something that usually doesn't happen until well after first frost -- it becomes difficult to dig soil and replant what has heaved up. The National Snow and Ice Data Center provides an excellent explanation of how ground freezes. Based on NOAA first frost predictions for both Albuquerque and Richmond, it appears that the best cut-off time for planting in both your cities would be during the first week of October. This will give each of you at least a few weeks for root stabilization. A cut-off of one month before frost is ideal, but local temperatures may not allow planting a full month before first frost. Daily temperatures indicate when it is best to begin fall planting. Data from the website accuweather.com shows that daytime temperatures in Richmond will mostly be in 70-degree range by the last week of September, whereas Albuquerque temperatures aren't likely to average in the 70s until the first week of October. Although, your brother is right that he'll likely have planting temperatures in Albuquerque nearly until the end of October, his plants won't be well established to withstand heave if he waits that long. So he has a shorter window of opportunity for fall planting than you do. Please try not to get too uppity with him about your advantage. Thanks for your question. It helps gardeners nationwide, who can use the links and process provided here for determining their windows of opportunity for planting. If you need more advice, please feel free to email or call us at Flowers by the Sea. My salvias arrived beautifully packaged and in excellent health. I can't wait to watch them take off. Thank you Flowers by the Sea.